When extraordinarily fragile pieces are treated by The Center, often the conservators recommend handling the pieces as little as possible to preserve their longevity. So when Gloria Diaz brought in a delicate lace mantilla and expressed that she would like it to be functional for future ceremonies, we knew we had our work cut out for us. At the time Gloria brought in her mantilla, it had been used by three generations in twenty-four weddings, ten baptisms, on “Taking of the Veil,” and one First Communion. Since the lace garment had been both well-loved and well-used, it exhibited inevitable signs of wear. As Gloria noted, “I realized that the mantilla was near the end of its life if we did not do something to improve its condition. Because of its special place in our family, we wanted the mantilla to be something that existing and future generations would use.” After a thorough search, it became apparent that it would be exceptionally difficult to find a conservator trained to conserve the mantilla in the United States. Gloria had resigned to delaying the treatment of the mantilla until her next trip to Spain, and having it treated there, when a friend suggested contacting The Conservation Center. A mantilla is a ceremonial Spanish garment which is often passed down through many generations. The original development of the mantilla, as with many traditions, varies on several accounts. Some state that the mantilla originated in the northern regions of Spain, where its functionality was more that of a blanket. Eventually, the decorative blankets were modified to have a strictly decorative appearance, and worn as a headscarf. Conversely, other research posits that the mantilla is a modification of a Muslim headscarf adopted by the women of the Andalusia region of southern Spain, due to influence from North Africa. Regardless of origin, the mantilla rose to the height of its popularity during the 17th and 18th centuries. The tradition of wearing the lightweight lace or silk veil over a toothed comb, or “peineta”, became widely accepted. Queen Isabella II (1833 – 1868) is credited with making mantilla use the height of fashion. Her backing of the use was considered part of an effort to heighten nationalist sentiment. White mantillas were worn during holy week, bullfights, and weddings; black mantillas were traditionally worn when the wearer had an audience with a pope. Given the rapid globalization of the 17th and 18th centuries, these traditions were soon spread to South and Central America thought Spanish colonization. Gloria’s mantilla, made of hand-embroidered lace sewn onto silk tulle, is a wonderful example of this dissemination of culture. The mantilla originally came into their possession when it was bought for her aunt, Primitiva Diaz de Uriarte, by her husband, Mito, in 1952. The mantilla had exceptional sentimental value, as it was purchased using Mito’s portion of the sale proceeds of his family home in Galdácano, Spain. Primitiva used it for the first time for the 1953 New Year’s Eve party at the Liceo in Matanzas, Cuba. In this particular case, she used it as a wrap. The mantilla was first used in a religious ceremony at the wedding of Gloria’s oldest cousin in 1958. 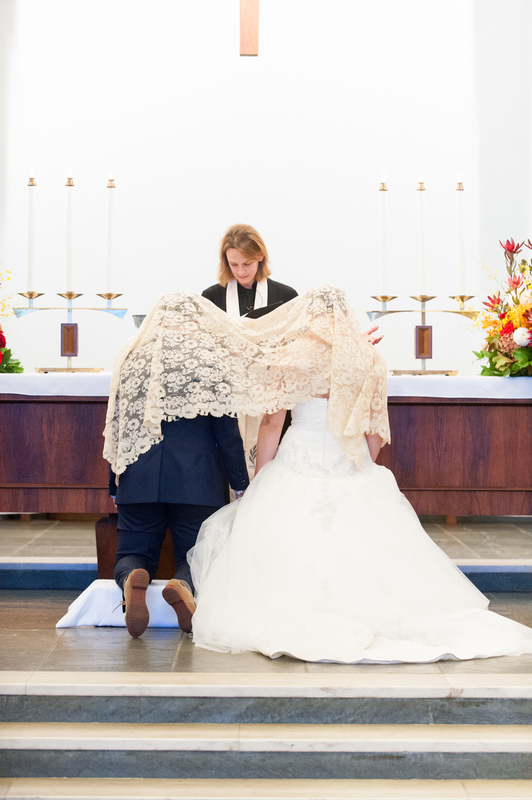 In keeping with tradition, the mantilla is used during the consecration portion of the Catholic mass, the couple kneels and the mantilla is draped over the shoulders of the groom and the head of the bride until they rise for the “Our Father”. When Gloria’s family emigrated from Cuba in 1960, the mantilla was one of the few heirlooms they brought with them and has become an important part of the family history. When The Conservation Center first received the mantilla, the textiles conservator noted areas that could be improved. The lace panel showed inherent darkening of the textile, previous repairs with glue and stitches, and extensive scattered splits and holes throughout, along with extensive fraying and splitting at the ends. First our conservator tested the areas of hardened adhesive to determine the best treatment approach. Once the appropriate solvent was selected, the piece was meticulously vacuumed through a protective screen. An extensive process was undertaken to wash and remove the adhesive from previous conservation campaigns from the textile.